The rumors have finally come to fruition: Business profiles are arriving on Instagram. Accounts that are recognized as a business will receive tools to help measure engagement and promote their posts. The Insights tool, for example, lets business account owners see their followers and post performances based on time of day to figure out when to best publish something. 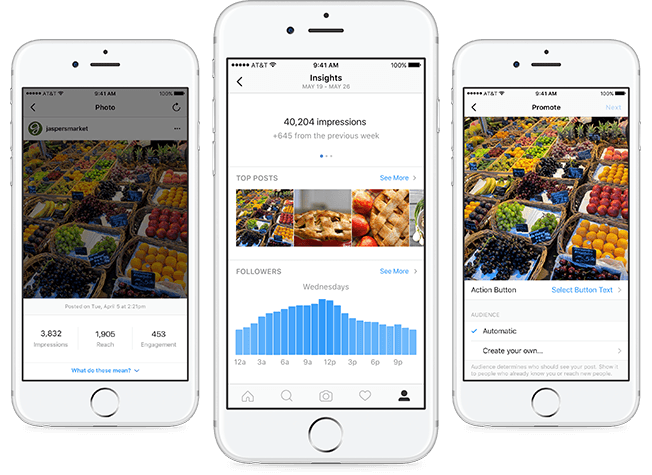 Promote is pretty self-explanatory: Businesses can now select a target audience to whom they can promote a post, or let Instagram sort this out automatically. You can also add a time period for promoted posts and add call to action buttons. With more than 200,000 companies using Instagram to promote their businesses, it was inevitable that Facebook would unveil tools to help these users. The tools even look like Facebook’s own page insights tool, which displays reach and impression numbers alongside fan growth rates. It’s clear that Facebook assumes its business users would use both Instagram and Facebook, since the tools are so similar. Instagram’s business profile and tools will roll out first in the United States, Australia, and New Zealand. For everyone else, the company promises global rollout by the end of 2016.